As reported by Matt Vespa, Georgia Democratic Gubernatorial Candidate Stacey Abrams has bowed out of the governors' race, saying it is evident that Republican candidate Brian Kemp will win. But in stark contrast to her support for the integrity of US elections in 2016, Abrams has declared that simply because she acknowledges his victory does not mean she is conceding and in fact, it means that "democracy failed Georgia." Abrams team has continuously claimed that Kemp, Georgia's Secretary of State from 2010-2018, was essentially rigging elections through what she claims was voter suppression. Abrams announced she will sue the state of Georgia for the "gross mismanagement of this election and to protect future elections from unconstitutional actions." She also plans to establish a group intended to protect voting rights called "Fair Fight Georgia." Kemp's team released a statement thanking Abrams for her hard-fought race. "Moments ago, Stacey Abrams conceded the race and officially ended her campaign for governor. I appreciate her passion, hard work, and commitment to public service..The election is over and hardworking Georgians are ready to move forward. 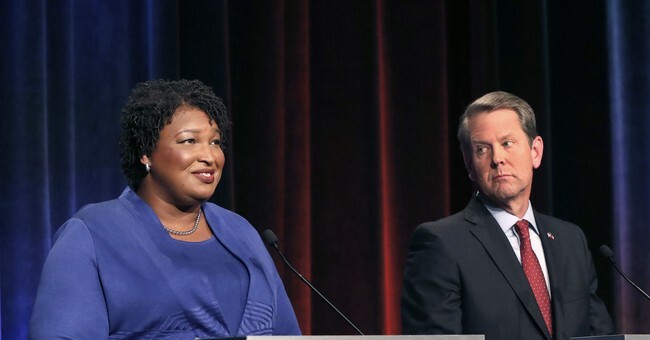 We can no longer dwell on the divisive politics of the past but must focus on Georgia's bright and promising future," Kemp said. Abrams comments regarding supposed democratic failure are nearly the polar opposite of comments she made against GOP 2016 presidential candidate Donald Trump after he refused to state whether or not he would accept the results of the election if he lost. At the time, Trump had made comments that the Democratic Party might steal the election through voter fraud and other illicit means. Presently, Abrams claims the gubernatorial race was rigged for a variety of reasons. National Review's Rich Lowry does a great job explaining why those reasons just aren't so. His full piece is well worth the read, but in short, he says "Every indication is that Stacey Abrams lost fair and square in an election where everyone knew the rules beforehand, and they weren’t unreasonable. She’s nonetheless being hailed for not conceding, and her loss will always be taken as an indictment of Georgia rather than the verdict of voters." As noted by Matt, Georgia reached this point today "on election day, the Kemp lead Abrams50/48, and that never really was chipped away in the days after Election Day. Abrams was trying to muster enough votes to trigger a recount or a runoff, which would have been held on December 4. She needed 19,300 additional votes to initiate a recount and 21,700 for a runoff; it was pie-in-the-sky. Yet, last weekend, Democrats touted new absentee ballots (funny how new ballots keep popping up) that numbered in the thousands that could sink the GOP. It didn’t. Simply put, Kemp beat her."